Pre line a baking tray with a My Relationship with Food silicone baking mat or parchment paper. Add the whole baby carrots to the baking tray to one side of the tray and the cubed butternut squash and sweet potato on the other side. Drizzle the vegetables with 2 tbsp. olive oil and season with sea salt and cracked black pepper. Place in the pre-heated oven for 40 minutes; gently turn over the vegetables after 20 minutes to prevent burning. When the vegetables have cooked, remove the tray from the oven and drizzle over 1 tbsp. honey or agave nectar and leave to cool. To make the chimichurri sauce blend the garlic, herbs, oil and vinegar in a food processor until combined. To make the tahini dressing, in a medium bowl add the tahini and water, stir until a thick paste forms by whisking vigorously with a spoon. Add the lemon juice and season with sea salt. 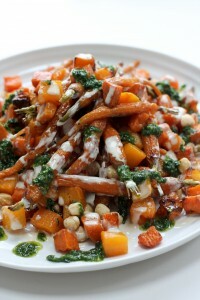 When ready to assemble on a large platter place a combination of the roasted carrots and sweet potato and butternut squash, drizzle over a spoonful of the tahini dressing and scatter with some toasted hazelnuts (optional). Keep repeating this layering method (this ensures that you have a good amount of the tahini dressing and hazelnuts combined throughout the salad). When you have completed assembling the salad drizzle the chimichurri sauce over the top. My relationship with food is available to order at www.myrelationshipwithfood.com, £25.